The agriculture industry is in a constant battle about animal welfare and care and it has become a very serious issue over the past couple of years. However, I feel that many farmers don’t necessarily know how to react when attacked by certain animal-rights activist groups or even just the general public. Not every individual is an excellent speaker in front of an audience, but as for farmers, being proud of what you do and how you take care of your animals and land speaks louder than words itself. As we milk the cows at the state fair, we usually get a large crowd of people watching us. That’s when the questions start. I have heard many different questions and I love being able to answer them and inform the public and the individuals who really want to learn about what we do and how we take care of our animals. Many consumers don’t know where milk comes from and some even think it is actually made in a factory. Some people think that by milking cows, we are hurting them, when in actuality we are reducing their stress and pressure which makes them more comfortable. We are stewards of the land and animals, and I like to make sure the public at the state fair know that we treat our cows as if they are one of us. 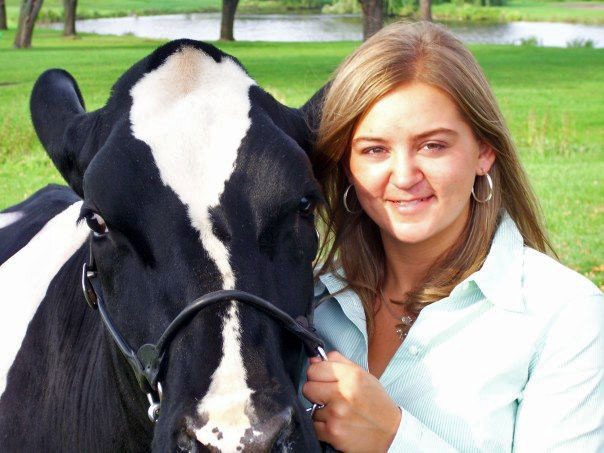 I like to think of it as an opportunity for me to use my knowledge of communications and also my knowledge that I have learned as I have been raised about the dairy and agriculture industry. Speaking positively about the industry and not bringing up the negatives of the industry is key when speaking to the public. As the battle continues for the agriculture industry, it is important for individuals to positively promote the industry and be brave about talking what you do and how you do things on your farm with your animals. Being proud of being a farmer is the key to delivering a positive speech to someone when needed. Personally, I feel that expressing the love that I have for taking care of animals is one of the most positive thoughts you could give to the consumer. Letting them know that you truly care and love the creatures you work with will allow them to see that you actually care and have a passion and that it’s not about self-enjoyment. For me, raising animals and working with God’s land, is very therapeutic for me. Whether it be riding my horse or milking cows, I find that time to search myself and release stress. Communicating to the public in a positive, fun way is the key to letting them know that we as farmers are helping take care of God’s creatures. I feel he created humans to take care of the land and animals. Even though there are individuals out there who mistreat the animals they own, I would say 98% of animal lovers and caretakers do just the opposite. I know for a fact that when we lose an animal on our farm from an illness or unknown reason, it feels as if I lost a part of my family. So, with that in mind, farmers love what they do and love their animals. If they didn’t, they wouldn’t be a part of the agriculture industry. Make sure you challenge yourself each day to tell your story. Tell about the ups and downs and the roller coaster of life that you experience working in the agriculture industry. You never know what might ignite in the eyes of the consumer when you talk about delivering a new baby calf, helping save an animal’s life or planting the seed that will end up being the food on their table. Courtney Lipply is a senior in Agricultural Communication with a focus on Journalism/Advertisement.